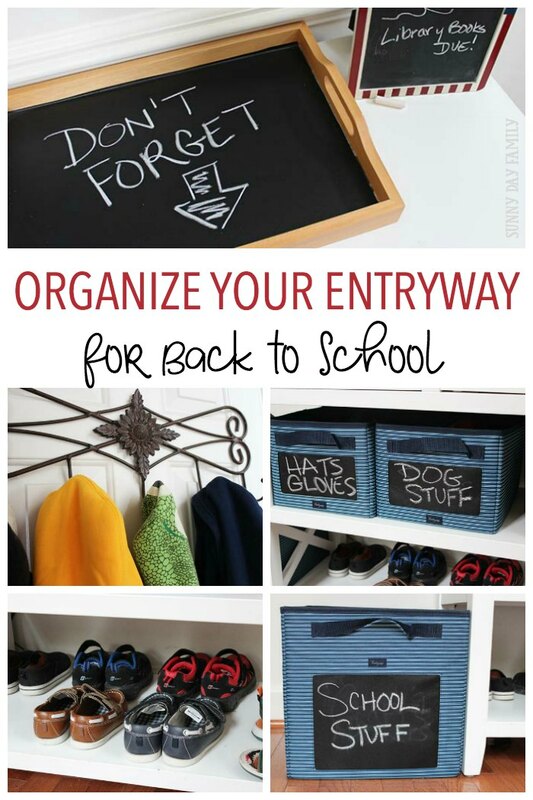 Organizing your entryway for back to school? You need these essentials! Getting twin preschoolers ready and out the door is quite a challenge. I know that when we start school this year that we are going to need to be as organized as possible to make it out on time with everything we need. I just finished organizing my kids clothes so that we have everything laid out and ready ahead of time, and my next project is organizing my entryway so that we know where to find our shoes, bags, and jackets and we have everything we need to take to school each day. Your set up may look different than mine, but there are a few essentials that everyone should have to create the perfect family "drop zone" before the first day of school. We don't really have a mudroom. It's probably the one thing I would add to my house if I could get some more space. Our laundry room is very small and doesn't have the space I need to make it an organization center. We do have a large foyer, and it has become our family "drop zone" - the place where shoes, bags, and jackets get dropped when everyone gets home. That's no big deal in the summer when it's just flip flops, but as we head back to school we are going to have a lot more gear and we need to get organized. As I'm prepping the boys for preschool, I'm figuring out the essentials that we need to have ready for each school day. I've put them all in our newly organized entryway and I'm really happy with how it looks. 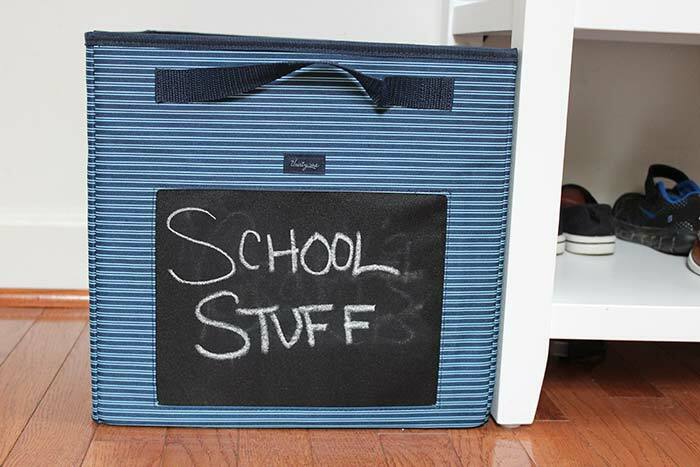 It's functional, organized, and the boys can access everything easily. While you may need to adapt this to a mudroom or kitchen space, the essential items should stay the same. 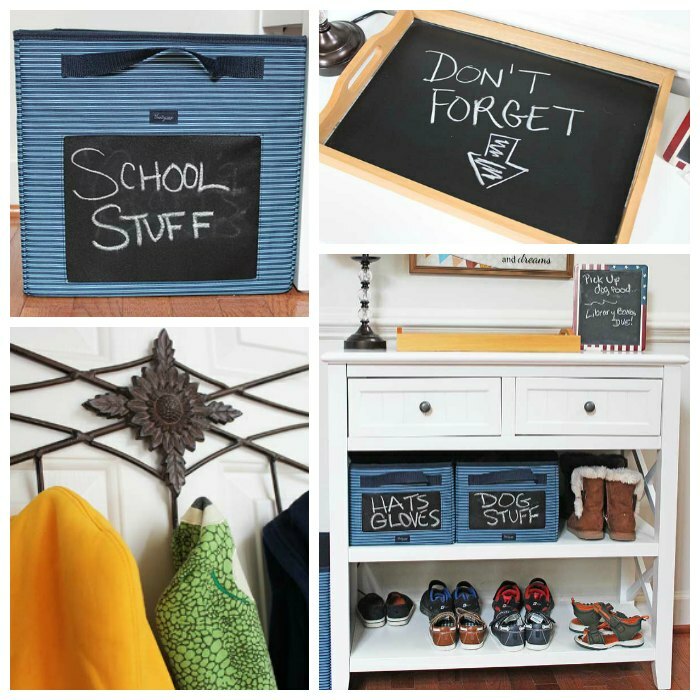 Ready to organize your entryway? Here's what you need. Our white console table is the perfect place to start our organizing project. Last winter, I updated this area for snow boots and winter gear, and now it's getting a makeover for school days. 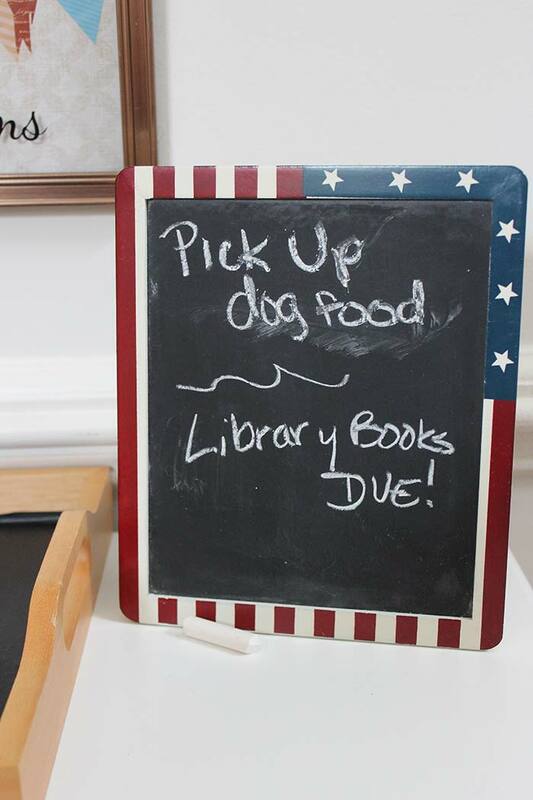 If you have dogs in your family, you may also need a bin for dog supplies. 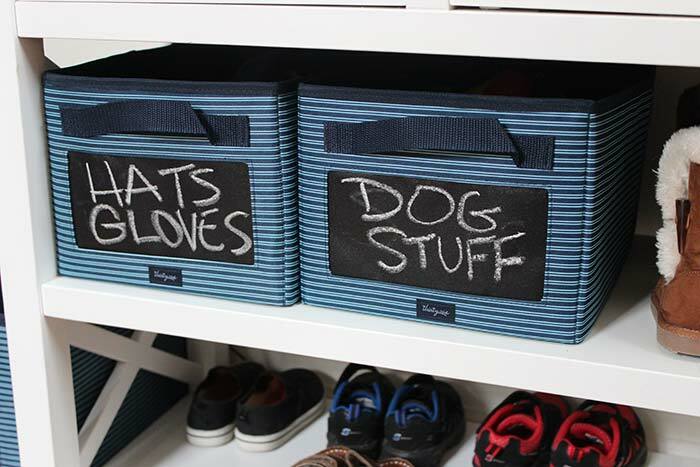 This is where we keep the essentials for taking our dogs for walks - leashes, waste bags, and paw wipes for when they come in. Keeping this right by the door is one of the ways that I keep our floors clean from muddy paw prints. 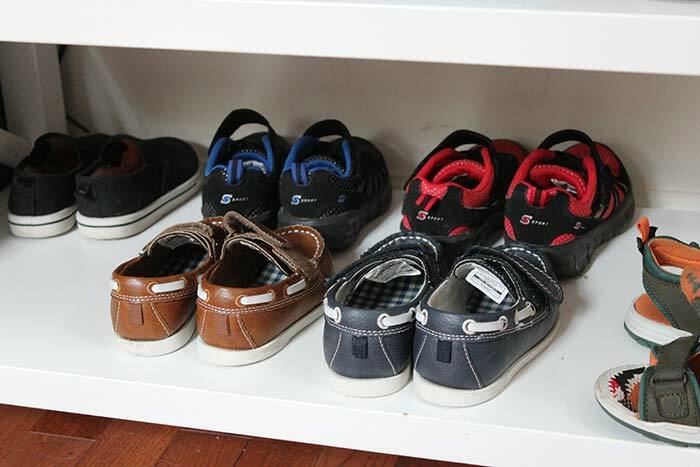 You want to make sure that you have a place to keep your kids' shoes and that they learn to put them away in the right place when they get home. The bottom shelf of our table is perfect for this, as it's low and easy to access, yet open enough that shoes won't be lost in the bottom of a pile. You also need a quick and easy place to access jackets and coats. 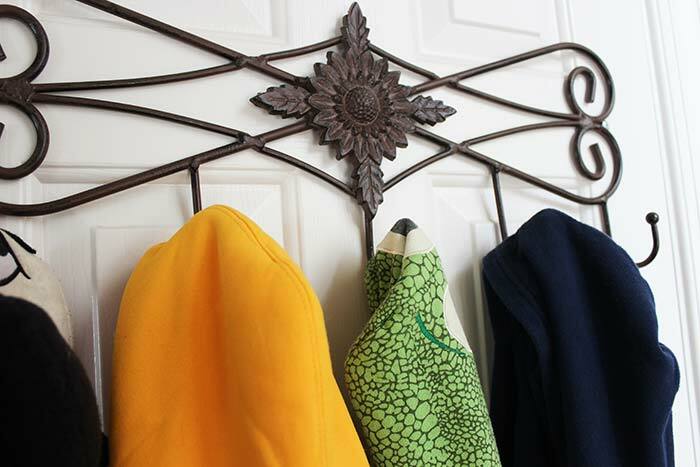 We installed some decorative hooks on the back of the door so that we can easily grab jackets as we head out (and make sure to hang them up when we return.) These were a gift from my mom, but you can find tons of choices to fit your decor on Amazon. Another "drop zone" must have is a spot for kids to leave their school bags so they know where they are and can easily find them the next day. I'm using a floor bin next to our table as our bag drop area, and it's a great way for me to keep anything that we need to remember to take to school each day. This is probably the most important spot in your entire entryway. 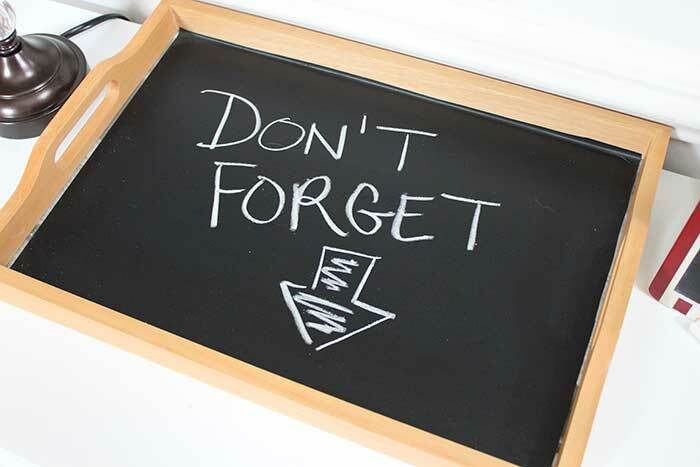 I call it the "Don't Forget" zone because it is where you'll put anything that you need to remember to do or take with you in the morning. I covered an old wooden tray with chalkboard contact paper to be our "outgoing" box. It's important that this spot is used for only for outgoing papers, books, etc. One of the things that I do every day is make sure that I deal with all incoming papers as they enter the house, and if you let them pile up here you'll be disorganized before you know it. 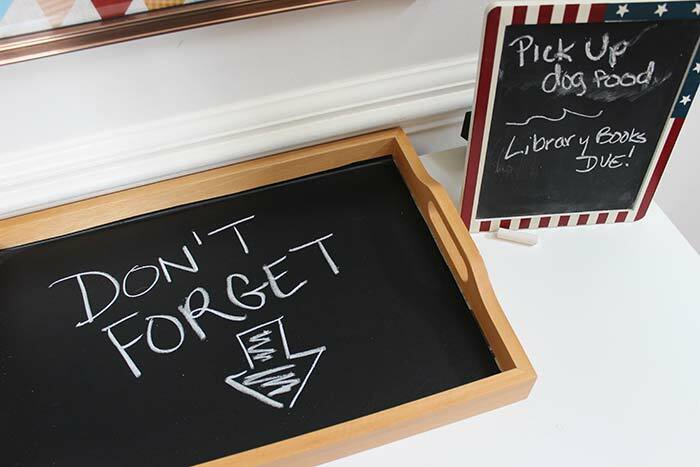 Creating the chalkboard tray means we can also write notes in here or make lists of what we need to remember. I'm so happy with how our organized our entryway is now - we're ready for the first day of school! Having a place for all our essentials will help keep our days running smoothly and let us focus on enjoying our family time (instead of searching for missing shoes). Are you looking for more ideas to organize your life so you can enjoy your family? See all my organizing and cleaning tips for your home, mealtime, and more printable planners to help you get organized! Find it all here.